If you’re friends with a bookworm, the chances are they are a massive penguin fan and will have a collection of vintage penguin books (guilty) or some kind of penguin lifestyle item hanging around their house. What better way to jazz up a book that you’ve bought them for Christmas than this handmade bookish penguin gift tag which doubles up as a unique bookmark that can be enjoyed long after the rest of the wrapping has gone? Sketch out your penguin onto a piece of plain paper. When you’re happy with the design, turn your paper over and shade heavily with a graphite pencil. Hold this over your book page and pressing heavily on the paper, draw over the penguin so that the image transfers like the one below. 2. Using black paint and a fine brush, carefully go over your pencil lines then fill in the black parts of the penguin on the book page. 3. When your penguin has dried, cut out an oval of paper which fits around the penguin and trace the shape around your penguin to give it a good border. Cut this shape out and stick it onto a white card background. 4. Cut around the oval to create a white border and then stick the bordered oval onto another shade of card of your choice. I chose gold to make it feel Christmassy. Once these have dried, make a small hole in the top of the card and thread with decorative twine or ribbon to allow you to use it as a tag or as a bookmark. This entry was posted in Bookish Christmas, Craft and tagged books, bookworm, Christmas crafts, craft, gifts, penguin, reading on December 8, 2018 by Siobhan. It’s that time of year again. You know, less than a month to Christmas and a lack of ideas for secret santa presents or stocking fillers has you panic buying “funny secret santa presents” like stressticles or office voodoo dolls which the recipient will throw in the bin by January 1st. I’m here to make a plea that you save the planet from the extra plastic waste, and for under £15 buy them book that they will enjoy for at least three hours, if not a lot longer. The best bit? These will all be available at your local bookshop for a last minute Christmas gift. For readers of a certain age (my age) the release of La Belle Sauvage: The Book of Dust by Philip Pullman , the first in a new trilogy which is set to be a companion to his Northern Lights trilogy was probably the publishing event of the year. Hailed as a tidal wave of imagination, though darker and more savage than the original trilogy, it’s a safe bet for any lover of fantasy. The most powerful work of speculative fiction that I’ve read in a long time, Naomi Alderman’s The Power is a must read for any fan of Margaret Atwood. I keep meaning to write a review of this, but my mind is still processing the emotions I felt reading it. It’s a safe present for any woman who hasn’t read it, and it’s always interesting to listen to people’s post-read dissections. I was delighted to see the new edition of Kate Bradbury’s best-selling The Wildlife Gardener publish this year and swiftly bought myself a copy. It’s the perfect present for any gardener or wildlife enthusiast, and gives fun, practical advice for creating a home for wildlife in what outside space you have available. Saving the planet starts here, folks. Remember when Oxford University Press decided that children no longer needed to be able to look up words like acorn and bramble in the dictionary? Well that outrageous act inspired Robert MacFarlane and Jackie Morris to create The Lost Words, this beautifully illustrated volume of poetry. A spell book which reminds adults and children alike about the power of words, reading the poems brings the words back to life and gives nature power and relevance for a new generation. Winner of the Man Booker Prize 2017, and shortlisted for multiple awards and honours besides, Lincoln in the Bardo is a safe fiction bet for anyone who likes to read the current big novel. This first novel is an experimental work of fiction, a story of love after death which looks at a problem which faces all humans, how do you find the courage to love when it means you will face loss? A beautifully illustrated picture book, with a story in the tradition of the old fairy tales, Hortense and the Shadow is dark and exhilarating at the same time. This is set to become an instant children’s classic which adults will love as well. I’ll be adding it to my collection. I loved Last Stop on the Reindeer Express so much when it published that I bought it only a month later to read with my daughter on Christmas Eve. It would make an ideal Christmas present for any picture book lover or younger gift recipient. A little girl who is missing her Daddy discovers a world within a post box and goes on a beautifully illustrated lift the flap and peep through the pages adventure. I can’t wait to read it as a family before Santa visits. In case you worried that you’d run out of presents to buy for Harry Potter fans, the launch of the Fantastic Beasts film franchise has also lead to the publication of this beautiful Fantastic Beasts and Where to Find Them book which reminds me of the Tolkein’s bestiary that I had as a child, with the names, descriptions and magical illustrations of all the fantasy creatures you encounter in the Potter novels. Adam Kay is a comedian and former junior doctor, and This is Going to Hurt is his frank memoir of life on the front line of the NHS. Hilarious and heart-breaking, it gives you an insight into what life is really like for the junior doctors keeping us and the NHS ticking along. I always find it fascinating when an author I admire writes an exposition on their craft. Philip Pullman is indisputably something of a master storyteller, and in Daemon Voices, a collection of thirty essays, he lets his readers peer behind the veil to learn about his views on storytelling, including such topics as the origins of his own stories, the art of writing, and the storytellers who have meant the most to him. A great gift for readers, and aspiring writers. This entry was posted in Uncategorized and tagged books, Christmas, gifts, secret santa, shopping, stocking fillers on November 26, 2017 by Siobhan. If you’ve read this blog for a while you probably know I have a slightly sacrilegious attitude to many of the classics which form the literary canon, but despite this I love Wuthering Heights, Jane Eyre and all things Brontë. The sister’s lives could have been a novel in their own right, I’m pretty there isn’t a massive motion picture being promoted at the moment, given the success of biopics about Keats, Austen and Potter in recent years. Either way, their books are amazing, a blend of the Gothic and Romantic traditions which are perfect for reading on cold winter nights. Consequently, I have decided that Brontë inspired items would make great Christmas presents for the Romantic (with a capital R of course…) in your life. Here’s a list of my favourites. If it was the Romance with a capital ‘R’ that brought you here, then I think that these earrings which quote Cathy’s outburst about Heathcliff being “More myself than I am. Whatever our souls are made of, his and mine are the same” has to get a mention. Almost certainly one of the best declarations of love in literature, and one of the ones with the most heartbreaking outcomes for the couples involved. If you’re looking for a present for an aspiring writer, they may take inspiration from this mini journal which is embossed with Charlotte Brontë’s writing from the manuscript of Jane Eyre. It’s a bargain at £6.99 and would make a lovely diary. I mentioned some time ago that I didn’t want so much as need this amazing paper cut style poster which is being sold to raise money for a charity which aims to fight illiteracy. So for about £40 you effectively have a gift that gives twice, a beautiful picture for the recipient and a better life for someone who learns to read. It may be because I’m decorating my house at the moment, but I’m a big fan of this Wuthering Heights decal which contains part of one of my favourite passages in literature. I think it’s great inspiration for a gift for a book worms, you could order a custom decal with a favourite passage from any book, or even a song lyric. I would put this up in a shot if my boyfriend would let me. Compromise leads to a very bland aesthetic. This entry was posted in Uncategorized and tagged books, Brontë, Christmas, gifts, jane eyre, Jane Eyre presents, literature, presents, shopping, Wuthering Heights presents on December 6, 2012 by Siobhan. Recently, instead of catching up on the news while I wait for the bus, I’ve been reminding myself how much I love reading classic fairy tales by reading the stories of Hans Christian Andersen and The Brothers Grimm as eBooks on my phone. The stories are still great, but the lack the magic of settling down by the fire with a beautifully illustrated book. In honour of Christmas Magic, I thought I would share my top fairytale inspired Christmas presents. I hope you find them helpful when shopping for gifts for fairytale lovers. No list of gifts for lovers of fairy stories would be complete without the Folio Society Fairy Books. Colourful, luxurious and beautifully illustrated with introductions from key names in folklore studies, I think they would make the perfect Christmas present. I’m tempted to start a collection as well, but where to start? They’re all so beautiful. The Folio Fairy Books are quite expensive but have real heirloom potential. , is made from solid silver, and can be customized with a personal message especially for your fairytale fan. It also comes in a really cute little gift box, which is a bonus if you’re no good at wrapping presents. I have this necklace and people always ask about it, especially children who want to open it and read the story inside (it doesn’t open sadly). I love Heather Alstead’s Fairy Tale range at Not On The Highstreet, there are so many beautifully designed products, but these storytelling bookends, happily ever after bookmark and dragon slaying mug have to be my favourites. This entry was posted in Uncategorized and tagged books, Christmas, gifts, life, presents, shopping on December 4, 2012 by Siobhan. As you may or may not have noticed, I’ve been a bit slow to the post this month. The main reason for this is Virgin Media. Apparently they’re updating our area to broadband which is twice as fast as light soon. Sadly, this won’t matter much if their service continues to be down two weeks in every four. Anyway, that’s why I’ve been a bit late sharing some of the lovely bookish presents I received from my family and friends this Christmas which I thought any bookworms out there might like to see. They’re pretty cute! 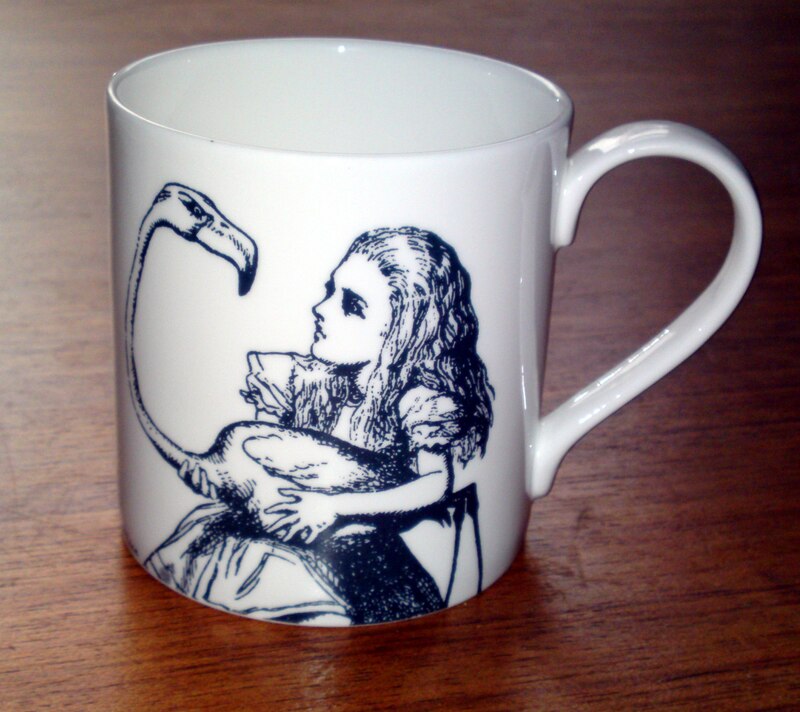 My friend George got me this cute mug with Alice wrestling the flamingo to play croquet. I think it might be from Whittard. It’s now my tea mug of choice, out-ranking even my Wizard of Oz mug collection. Jon’s mother bought me this Books to Check Out journal. It’s really handy with columns for books to read (really handy for me because I can be a bit scatty when I’m busy) and sections for favourite passages and books lent. It also has a pocket in the back which will keep my scribblings safe until I get a chance to use them sensibly. My mother bought me this apron which I guess is based on the Golden Shred marmalade campaigns of the 50s. It reminds me of the illustrations in Enid Blyton books like The Magic Faraway Tree that I read as a child. Or maybe even the Noddy books to some extent, though those were more my little sister’s thing. Perfectly matching the theme of my blog, my superhuman cousin turned up at with this amazing box of biscuits neatly wrapped just days before she went into hospital to have my gorgeous mini-cousin Cari. The biscuits quickly evaporated (how does that work, scientists?) but the box will live on forever at my desk. With helpful little snack in case I need energy to help me think. Last but not least were this bumper set of Penguin post cards from Jon’s sister. I’m a big fan of the Penguin look- a great design which is both classic and contemporary, they’re a publisher’s dream. I’ve been collecting some vintage look postcards for a while with a view to framing them and using them to decorate the walls. The fanned postcards are ones I’ve picked out from the set to use for this, and the rest I’ll use in my correspondence. Now to order frames. Where did I put that measuring tape? This entry was posted in Direct Speech and tagged books, gifts, home on January 26, 2012 by Siobhan.